Do you like bananas? How about rum? Cake anyone? How about something quick and easy. Something where the longest time involved is the baking time? Well, I am a rum lover. I can’t say I “love” bananas on their own, but I sure do love them in certain baked goods. I’m also one who likes “mini” as compared to “regular” cakes but hey, sometimes making a “regular” sized cake isn’t a horrible thing. Sometimes it turns our much more moist. Sometimes you just don’t have the patience to make “mini”. Preheat oven to 350 degrees F. Spray non-stick bundt pan with cooking spray. In a large bowl, combine cake mix, baking soda, rum, water, eggs, bananas and nuts. Bring together, then beat on medium speed 2 to 4 minutes. Pour into prepared pans. Bake at 350 degrees F (175 degrees C) for 45 to 50 minutes, or until toothpick inserted into center of cake comes out clean. Cool 10 minutes and then invert cake onto cooling rack. For the frosting: Combine 1/3 cup butter or margarine with the confectioners sugar, vanilla and rum. Beat until smooth. Drizzle over cake. **Note: This made way more than enough frosting. 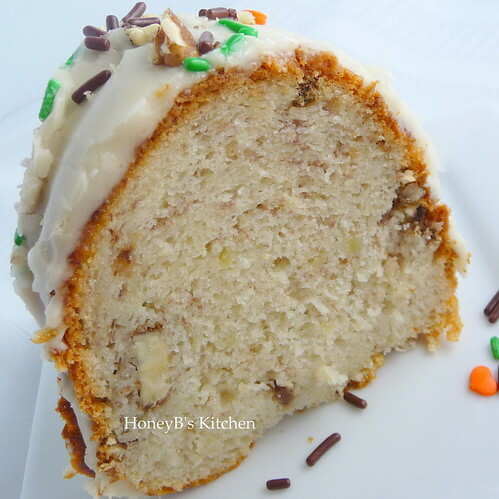 You could easily cut this in half and still have more than enough frosting for the cake. What a scrumptous cake ! Love your fall sprinkles on top! I'm been a sort of lazy cook this week too. 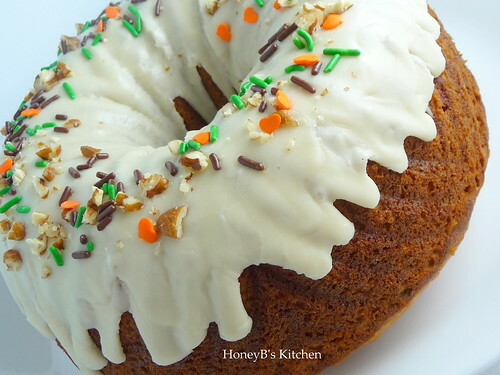 That is such a fall and festive banana cake. It looks too pretty too eat. But I know I would enjoy eating it. I love bananas and baking with them too! Wow that's picture perfect! I love banana cakes, and yes, I also use cake mixes every now and then 🙂 it's never bad to be lazy LMAO! Wow Shelby… that looks so fall-like and festive! And love the combination of rum and bananas. Mt brother has always made a rum cake from bacardi's that is always on our list at family gatherings. That cake looks so delicious! Is it as moist as I am imagining it? I totally love bananas and am always up for a shortcut so this is perfect! 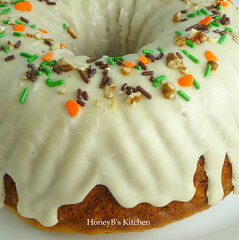 What do you think of using rum extract in place of the rum so my kiddos can have a slice? Great cake! I love the fun sprinkles too! So pretty and tasty. The perfect cake for this time of year. ohhh yum..I feel tipsy looking at it! YUM – that is one gorgeous cake! Looks so moist. Love the rum-banana combo! How strong was the rum flavor in the cake? I had bought a bottle of dark rum ages ago for a dessert involving ricotta and coffee. I don't drink much so it's been sitting on a shelf in the kitchen all this time. These pictures are amazing! I have to make this cake like yesterday!!! Rum and bananas! Oh yeah! I know this has to be good!! I love baking with bananas, now to add rum only makes it better. This sounds so up my alley, yum.. This cake looks scrumptious!! I adore the sprinkles on top.